How Does Bad Weather Cause Roof Damage? The roof on your home is much more than a protectant from weather. The roof provides structural integrity for your home. Roofing is constantly battling with Mother Nature, and after a storm you may notice some form of roof damage. A leaking roof can cause many problems for your home, from interior water damage to a loss of stability in the walls if the damage is severe enough. After any severe weather event that may have resulted in a roof leak or other roofing damage be sure to have a complete visual inspection of your roof completed by a roofing professional to ensure there is no problem present, which are often caused by the following. Heavy rainfall can overflow gutters which allows the rain to seep into the roof deck and shingles just above the gutter. This can cause major damage to the joints between the wall and the roof, which may compromise the structural integrity of the home if the damage is not taken care of in a quick manner. Another common cause of roof damage due to weather is hail. When rain freezes it can become very heavy, and when it is able to fall in the size of golf balls or bigger your roof is going to take a beating that could result in problems all over the roof. One of the more common causes of major roof damage is from wind and the debris that is carried by the wind. Not only can high wind speeds rip roofing apart on its own, if something being carried by the wind strikes your roof it can cause damage that will likely result in a roof leak. You may not be able to tell you have a leak right away without seeing the damage from the outside, but signs of a roof leak include black spots or stains on the ceiling where a slow drip through the roof to the attic floor may be occurring. A very real threat to your whole home is a lightning strike. A bolt of lightning could potentially start a fire. One way to help prevent this is to install a lightning rod. However, a strike to a rod could still cause damage to any roofing material. After a heavy weather situation be sure to schedule a visual inspection. 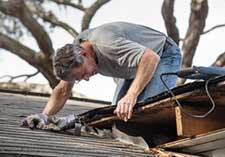 An expert roofer will be able to identify damages and complete the necessary roof repairs. For professional roof repair in McKinney or Wichita Falls, TX get in touch with Trifecta Roofing & Construction. We provide complete roofing services for all types of roofs, including shingle roofs, tile roofs, flat roofs and more. Give us a call at (469) 620-7672 to schedule superior roofing services in McKinney or Wichita Falls. Is it Time to Paint Your House? When is Time to Reroof my Home?